A black dog lopes through an apparently empty camp amidst a lifeless landscape. This eerie intro to Clément Cogitore’s fascinatingly spooky The Wakhan Front (2015) recalls a dustier, low-key version of John Carpenter’s The Thing (1982). Playing in the Cannes Critics’ Week sidebar, The Wakhan Front tells the tale of a platoon of French soldiers posted on a ridge overlooking a valley in Afghanistan. They are well dug in and their lives seem to pass in a routine enough fashion, watching the valley, keeping a weather eye out for the local Taliban – a warlord called the Sultan is operating in the area – while at the same time warily surveying a local village of sheep farmers with whom an uneasy compromise holds. The soldiers fire warning shots at one wandering shepherd in No Man’s Land. Then, one night, two of the soldiers disappear. Captain Antares Bonassieu (Jérémie Renier) leads the investigation with a level-headed professionalism. He talks to the villagers, keeps his own soldiers in check and has a firm hand on the tiller of command. His theory about how the kidnapping could have taken place despite the sentries equipped with night vision goggles is ingenious and convincing. He consoles a young expectant father, William (Kevin Azais), who cannot see past his own date for departure, but when he also goes missing things begin to look dire, as do the Captain’s rational explanations. Written with Audiard collaborator Thomas Bidegain, The Wakhan Front’s script is finely-balanced, allowing the possibly supernatural to slowly impinge without resorting to genre clichés. As with the soldiers, the direction has a workman-like quality as it goes about its task of exploring the story – Sylvain Verdet’s cinematography switching between the bleached daytime to the green fluorescence of the night vision the soldiers use. Alienation and absence are the themes as the out-of-place soldiers at first glibly ignore the gap in translation, brushing off complaints that don’t directly effect them. Their loyalty is to their own kind and their amoral mission can be seen when they allow the Taliban through their lines to the village, hoping their erstwhile enemies can get the villagers to talk now their softly-softly overtures have failed. As the soldiers are reduced to insomniac remnants, it becomes clear that the conflict that brought them there is increasingly irrelevant. 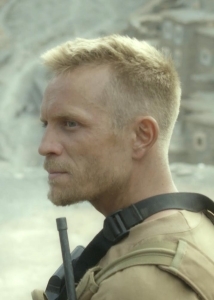 The suggestion that the Wakhan Front is actually the front of some new greater threat is of a piece with the quiet insidious way this small, detailed film nevertheless aspires to an almost cosmic scale. While never quite bursting out of its little corner of Afghanistan, The Wakhan Front is a haunting and original work.